My hobby is very social and many of my operating sessions also include a meal with friends. It may seem quiet around these parts – and it is. That’s because there’s stuff happening elsewhere in the house – specifically, in the back yard. My wife and I are busy overseeing a scorched earth-style garden renovation to transform a jungle into a space we actually want to use. Is there a railway modelling angle in all of this? You bet – as I explain on my Adventures in Live Steam blog. You can start at “Clearing the Jungle” and click your way forward through the posts. Or you can bookmark the “Garden Renovation” category and see all the posts, from most recent to oldest. See you at The Austin Eagle! I’m putting the finishing touches on the presentations I’ll be delivering at The Austin Eagle – the NMRA Lone Star Region’s 2018 convention being held June 13-17 in Austin, Texas. If you’re in the area and want to attend, click on the banner, above, to head straight to the convention website. For the Saturday night banquet, I’ll be offering up some thoughts about where the hobby is going, where we’ll find the next generation of serious hobbyists, and what we can do to foster them. For many of us, the hobby is more than a way to kill time. It’s a lifelong journey of friendships and learning. We love this hobby ‐ and many of us wonder how we can encourage more people to join us as railway modeling enthusiasts. In particular, we wonder how we’re going to reach younger people. Based on my experience in my professional life as a corporate speech writer, I’ve garnered some insights into the demographic known as The Millennials. I’m going to share some thoughts on how we connect with a cohort that has never known a world in which the Internet did not exist, and who many dismiss ‐ wrongly ‐ as being “more interested in playing games on their phones than in building things”. I’ll also offer some suggestions about how we make our hobby relevant to more people ‐ especially these Millennials ‐ at a time when few people encounter real trains on a daily basis. Since I’m making the trip for the banquet anyway, I’ve also offered to speak about my layout – but recognizing that an S scale Canadian-themed branch line will be of little interest to many at a regional convention in Texas, I’m using my layout as a jumping off point to talk about working in a minority scale. In my clinic, I’ll share the opportunities and challenges of modeling a specific prototype in a minority scale. I’ll cover how I ended up in a less popular scale and how that influenced my decision when choosing a prototype. I’ll offer suggestions for others to research and ponder to determine whether a niche scale is a viable one in which to work. Anybody who has ever considered switching scales or who is interested in working in a second scale can benefit from this clinic. I’ve never been to Texas. I’m looking forward to visiting Austin and putting some faces to some names at the convention: maybe yours will be one of them! Start your own dinner club! As I mentioned earlier this month, I was the guest speaker at the monthly meeting of the Ottawa Valley Associated Railroaders. I used to be a member, many years ago when I lived in the nation’s capital. And that experience inspired me a few years ago to set up a similar group in the Greater Toronto Area. The Toronto Railway Supper Club is a social club – we don’t build a layout, hold a contest, or have clinics. There are plenty of other organizations that do that – and members of those organizations are part of the supper club. As the name suggests, we get together once a month and have dinner. More recently, we’ve started having a member (or members) do a brief after-dinner presentation. The point is to gather with hobbyists who are, perhaps, outside our normal circle of friends or modelling interests. We can learn from each other, over a meal and an adult beverage. New friendships are formed, too! 2 – Start small. For the first event, I invited fewer than a dozen friends. I described what I wanted to do, and then at our first dinner, I invited to each invite somebody to join them at the second dinner. The idea was to grow gradually, so I could figure out the details as I went along. And by having my friends invite friends, I would meet a bunch of people I did not know well – that was the point, after all. 3 – If the group grows too big for your venue, look for another. This happened with us: once we were regularly getting 25-30 people at Harbord House, we found the noise level was overwhelming. People started to leave the club because it was just too loud. So I went looking for another venue. A friend in the club suggested Louis Cifer Brew Works, which has a mezzanine for larger groups, complete with audio-visual equipment that allowed us to do powerpoint presentations after dinner. 3 – Don’t get stuck in your own niche in the hobby. In other words, don’t make it an S scale group – or a free-mo group – or a D&RGW modellers group. Branch out. In our club, some are primarily interested in operations, while others focus on electronics… or live steam… or building structures. A broad variety of scales, gauges, eras and so on are represented. Some are members of clubs, or historical societies, or museums. Some are manufacturers, while others work at (or own) hobby shops. Some are historians, with no interest in modelling. But the best conversations happen when three or four hobbyists talk about a common subject from different perspectives. 4 – Find a way to organize the event that works for you. When I started the Supper Club, I did this almost entirely by email (sample below), and kept a list on my smart phone of who was attending in a given month. Now that two others are managing the club, they use Doodle polls to announce dinners and tally attendees. 6 – Encourage participation: ask people to bring out models or other projects to display and talk about. If someone is a member of a club, or historical society/museum, or organizes a train show, ask them to talk for a minute or two about what’s going on with their group. Supper clubs should be all about the cross-pollination of ideas. Getting people to talk about what they’re doing is what it’s all about. 7 – As for presentations, they’re a great idea – but keep them light, and short! Remember, most people in the room will not have a strong interest in or extensive knowledge of what you’re doing – and most of them will probably have had a bit too much to eat and drink, because hey: we’re having fun, right? So, no RPM-style clinics. No displays of your encyclopedic knowledge. Give your audience a break, with a presentation that will appeal to a broad range of interests: An overview of your layout is a good one, as is a rail fanning trip you recently took. Pictures are good! 20 minutes is fine. 40 is probably the limit. 8 – Encourage responsibility: encourage car-pooling with designated drivers. If you’re in an urban area, pick a venue that’s close to public transit. To help you organize your own supper club, here’s a copy of the typical email I would send to members to announce an event. PLEASE CONFIRM YOUR ATTENDANCE BY MONDAY, SEPTEMBER 18TH. And please do not “reply all” when confirming. IF YOU PLAN TO ATTEND, YOU MUST LET ME KNOW. It’s the ONLY “rule” for this group. Thanks in advance! If you do not want to be a part of this social group, let me know and I’ll remove you from the list. Just because you’re invited, doesn’t mean you have to attend – but we’d love to have you as a part of this group. If you know someone who you think would be a good addition, let me know that too. Send me an email with their email address, and I’ll invite them. That should answer most of your questions – but if not, ask via the comments. And if you start up a supper club, let me know: Maybe I’ll come for a visit! Yesterday, my friend Mark Zagrodney and his son Dan came over for an afternoon operations session on the layout. I try for perfect operations sessions – zero derailments, zero electrical problems, etc. – and for the most part I have succeeded. But this session wasn’t one of those. Everything stayed on the rails, but I did have some electrical gremlins. Once or twice, my DCC system kicked into short mode. I suspect, but can’t confirm, that something on a brass locomotive is touching something else that it shouldn’t – and that the lightning-quick circuit protection in the ECoS 50200 is catching the short before it clears itself. I’ll investigate that. More frequently, though, the Mobile Control II wi-fi throttle would lose its connection with the base station. A while ago, I talked to Matt Herman at ESU about this and he suggested moving the Wireless Access Point (WAP), or replacing it with one from another manufacturer. I’m going to try mounting the WAP higher in the room – right now, it’s in the drawer with the DCC system. If that doesn’t work, I’ll look at a more robust WAP. In part, I know the problems occur because I haven’t run the layout in a while (and I say that a lot lately on this blog). Unlike in the early days of Port Rowan, I’m less inclined to hold solo operating sessions these days. There are other things to do, and when I have hobby time, I try to work on something (such as the CNR 2-8-2 project). I don’t know if that’ll change. The hobby is a social one for me, so I’m really happier hosting operating sessions than I am running solo. I guess I’ll have to book more sessions to keep things rolling smoothly. Afterwards, we headed to Harbord House for dinner – of course! And I sent Mark and Dan home with a banker’s box full of back issues of MR, RMC and other magazines that I no longer need in my space. Read and recycle! I have a busy travel schedule this year, with a number of hobby events already booked across North America. Maybe I’ll see you at one of the following? I’m the after-dinner speaker for the monthly meeting of the Ottawa Valley Associated Railroaders (OVAR). I was a member of this amazing group in the 1990s when I lived in the nation’s capital and it’ll be great to catch up with many old friends from the hobby. I’ll be speaking about my layout. Once again, I’ll be helping Brian exhibit his “Roweham” layout – this time at the Great British Train Show. I’m attending the New England/Northeast Railroad Prototype Modeler’s Meet – my second time at this event. I’ll be giving a clinic on being a prototype modeller in a minority scale, and the opportunities and challenges this represents. I’ll use my layout as my example. I’m the banquet speaker at The Austin Eagle, the NMRA Lone Star Region annual convention. I’ll be offering suggestions on how to make railway modelling an appealing hobby to millennials – many of whom rarely see a real train. I will also present a clinic on my layout. I’m attending the St. Louis Railroad Prototype Modeler’s Meet for the first time. I’ve been asked if I would talk about S scale as a viable option for prototype modelling and naturally I’ll be using my layout as my example. I’m looking forward to meeting many new people, and catching up with friends (including those I’ve only ever met online). My trunks are packed and there’s a fresh pot of tea on the refreshment trolley, so I’m ready to go! Yesterday, I hosted Bob Harper, his brother Gerald Harper, and my friend David Woodhead for a layout visit. There are many interesting connections between us. I first met Gerald when I hosted members of the Toronto Chapter of the Canadian Association of Railway Modellers for an open house back in April of last year. Gerald got in touch recently to let me know his brother Bob was coming to North America from the UK – and bringing his exhibition-style Maine two-foot layout with him. Could they come for a visit? Of course! Subsequent to the visit to my basement, Bob and Gerald took Bob’s layout – Franklin in On2 – to the annual Railroad Hobby Show in Springfield, Massachusetts. You can read more about that trip on the MaineOn2 FAQ website. 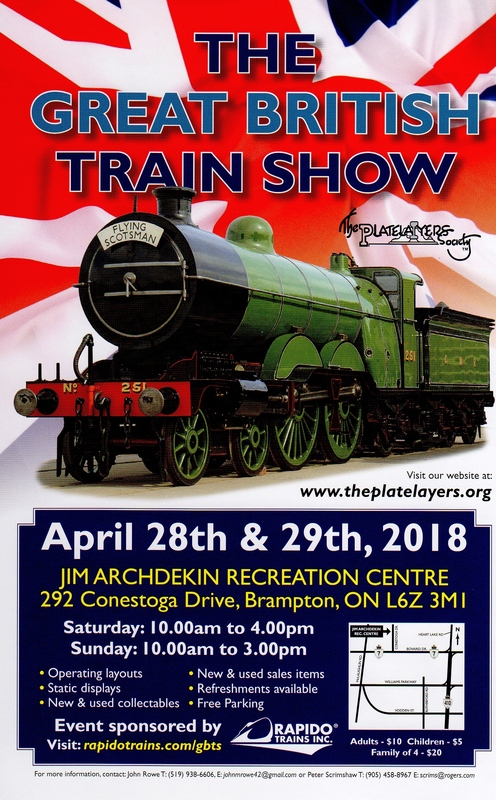 If you missed Franklin there, you have a couple more chances to see it on this side of The Pond: Bob and his layout will attend the annual Ontario Narrow Gauge Show in Schomberg, Ontario in April and the National Narrow Gauge Convention in Minneapolis, Minnesota in September.